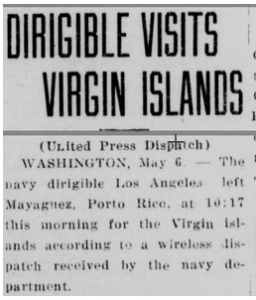 In 1925, one of the most remarkable events occurred in the history of the Virgin Islands. An incredible airship flew over the harbor of St. Thomas for the very first time! Commander Captain George W. Steel Jr. received a special request from Governor Phillip Williams. The governor wanted Captain Steel to “pass over the island” before making his way back from Puerto Rico to New Jersey. It was out of his way, but he made the detour to everyone’s delight. 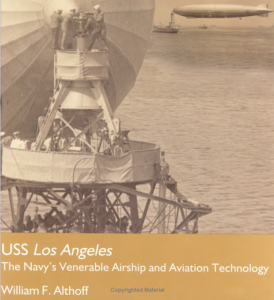 The Navy airship was called the USS Los Angeles. 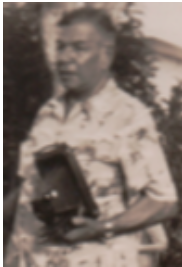 Our forefather, Herman O. Creque grabbed his folding camera and waited on his balcony overlooking the harbor for the perfect shot. Filled with awe and excitement, he snapped some of the first photos taken of the gigantic flying balloon. The next day, reports of the event made the front page news! “From the time the news about the airship’s arrival was publicized, everyone was anxious to see it! When it was announced that she had left Mayaguez, Puerto Rico at 10am, the various Consuls hoisted their flags in anticipation. At 2.45 pm, one ball was hoisted at the top of the staff at the Signal Station, indicating that the airship was in sight to the westward. Crowds of people made for the various wharves, terraces and hillsides to getter a better vantage point. At 3:15 pm, she came over the western hills. A huge monster! What a magnificent sight. Whale-like in appearance, on she came moving eastward until she got to the easternmost point, Flag Hill, then she circled around it, took up her former course and returned to the west” from whence she came. Mr. Adams shared his experience of watching the dirigible as she sailed over Frenchtown and Villa Olga. He said “she moved across the harbor, flew over Bluebeard’s Castle, and continued as far east as Tutu. She seemed to move without effort. We could barely hear the sound of her engines. After much excitement and fanfare, the airship pointed westerly in the direction of home and continued on her journey to Lakehurst, New Jersey. 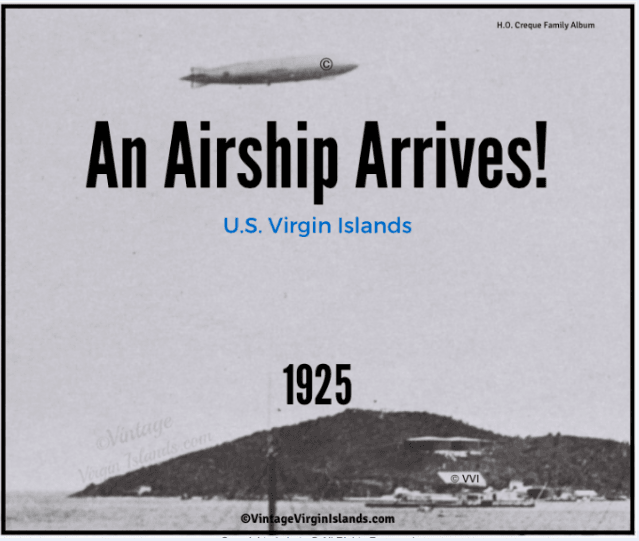 On behalf of all Virgin Islanders, the local newspapers praised Governor Philip Williams for bringing the airship to the islands. * The airship was 658 feet long, 92 feet wide and 100 feet high. When inflated, she carried 2,470,000 cubic feet of helium gas. Her cruising speed was 60 miles per hour. *The Memoirs of Alton Augustus Adams, edited by Mark Clague and foreword by Samuel Floyd, Jr. The Navy’s longest serving rigid ship. Photo: Library of Congress.